GALION — The Ohio Governor’s Youth Art Exhibition is the premier student art competition in Ohio. Approximately 12,000 pieces of original artwork were entered at the regional level, from which 2,500 were selected to move on to the state judging. From there, 350 pieces were selected for the Ohio Governor’s Youth Art Exhibition and showcased at the James A. Rhodes Office Tower in Columbus. Three Galion High School students had 3 pieces selected as regional winners in the District 2 judging at Ontario High School. Chelsea Hoffman (ceramics), Allison Longwell, (drawing), and Kruise Williams (ceramics) entered their artwork against nearly 1,000 other pieces from students representing 19 different school districts. All three students’ art work was entered in the state judging competition. 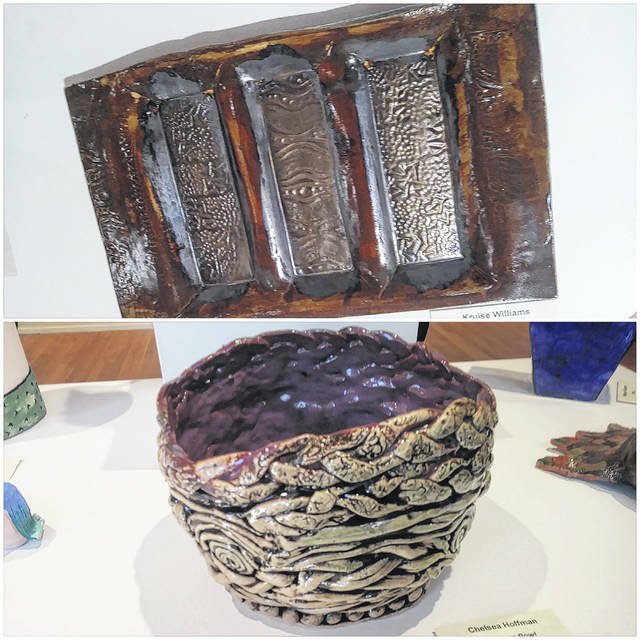 While their pieces were not selected among the 350 for display in the Columbus exhibition, their artwork will be on exhibit at the Mansfield Art Center through April 15. “Mrs. Wilson does a wonderful job working with our high school students to help them prepare for these kinds of competitions,” said Galion Superintendent Jim Grubbs. “I am very proud of these three students for having their work taken to the next level of judging in this year’s Governor’s art show and encourage everyone to visit the Mansfield Art Center to view and enjoy our students’ art work.” To learn more about the Governor’s Art Show, visit www.govart.org. Please contact Mrs. Linda Wilson at 419-468-6500 for more information about the Galion High School Art department. Courtesy photo Art created by Galion High School students Chelsea Hoffman (bottom photo), Kruise Williams (top photo) and Allison Longwell (not pictured) were regional winners in the Ohio Governor’s Youth Art Exhibition. https://www.galioninquirer.com/wp-content/uploads/sites/38/2018/04/web1_ghs-art-2018-1.jpgCourtesy photo Art created by Galion High School students Chelsea Hoffman (bottom photo), Kruise Williams (top photo) and Allison Longwell (not pictured) were regional winners in the Ohio Governor’s Youth Art Exhibition.